Create the inventory database which stores the hardware installed on remote computers: CPU type, motherboard model, memory size, hard drives, partitions, free space on disks, printers, DVD drives, videocards, external USB drives, etc. The program (10-Strike Network Inventory Explorer) is installed on administrator's computer only and uses WMI technology for scanning the hardware and software installed on remote computers. It does not require any additional components on network computers. The program supports other methods of gathering data if WMI cannot be used for some reason. You can even add the information on hardware from offline computers into one general inventory database. 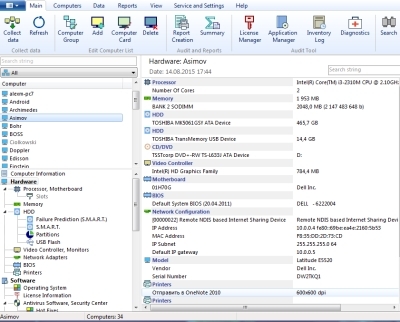 Vew hardware configuration on network computers remotely, track the configuration changes, and generate various reports. The software and hardware inventory data can be scanned once and viewed later when network computers are turned off.